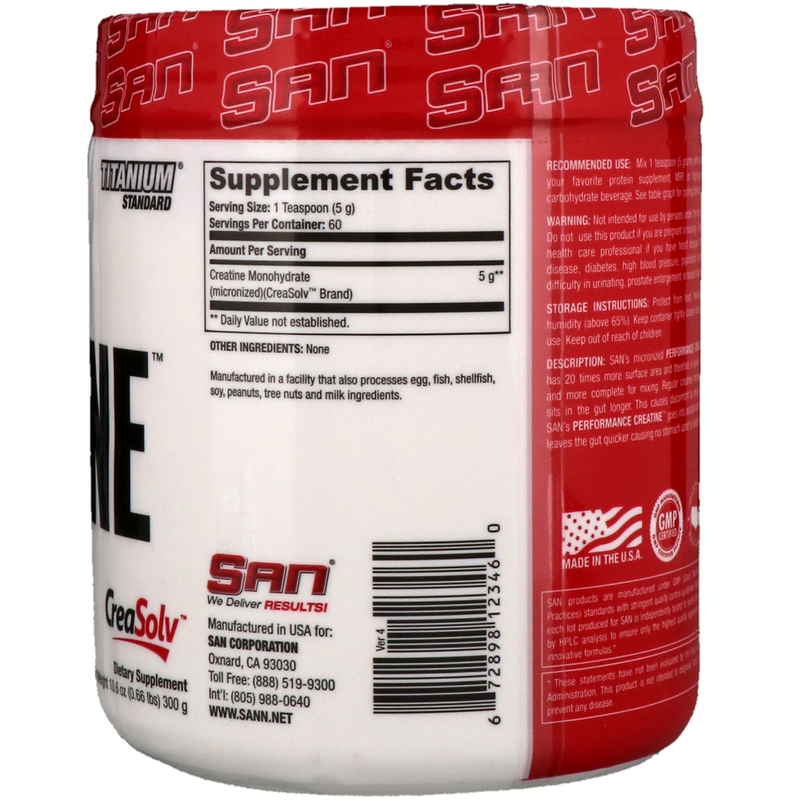 SAN's micronized Performance Creatine has 20 times more surface area and therefore is easier, faster and more complete for mixing. 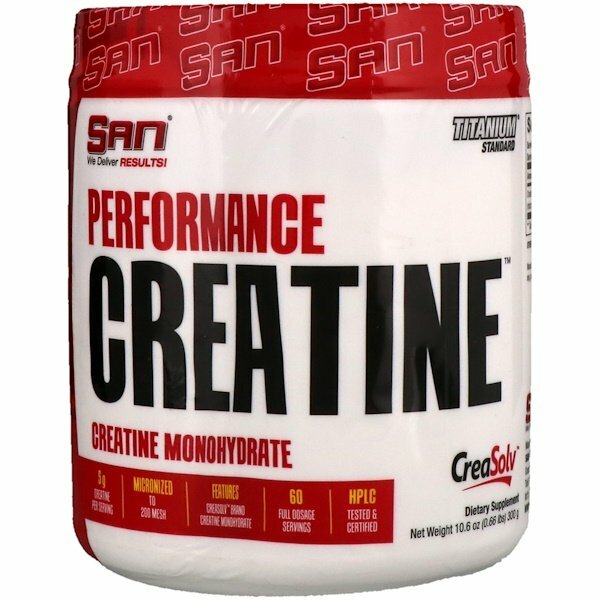 Regular creatine monohydrate sits in the gut longer. This causes discomfort to many users. SAN's Performance Creatine goes into solution better and leaves the gut quicker causing no stomach upset or discomfort. Mix 1 teaspoon (5 grams) with water or your favorite protein supplement, MRP, or high-glycemic carbohydrate beverage. Cycling direction: Creatine a supplement known for having a 'Loading Phase' followed by a 'Maintenance Phase'. A typical creatine cycle consists of three parts. Take 20-30 g daily (depending on body weight) for 5-7 days (Loading phase) then take 5-7.5 g daily (depending on bodyweight) for 3-4 weeks (Maintenance Phase). Take 1 or 2 weeks off creatine and repeat entire cycle (wash-out). SAN products are manufactured under GMP (Good Manufacturing Practices) standards with stringent quality control guidelines. Additionally, each lot produced for SAN is independently tested for purity and potency by HPLC analysis to ensure only the highest quality ingredients in our innovative formulas. Not intended for use persons under the age of 18. Do not use this product if you are pregnant or nursing. Consult a health care professional if you have heart disease, thyroid disease, diabetes, high blood pressure, psychiatric condition, difficulty in urinating, prostate enlargement, or seizure disorders. Storage instructions: Protect from heat, freezing, and humidity (above 65%). Keep container tightly closed when not in use. Keep out of reach of children.